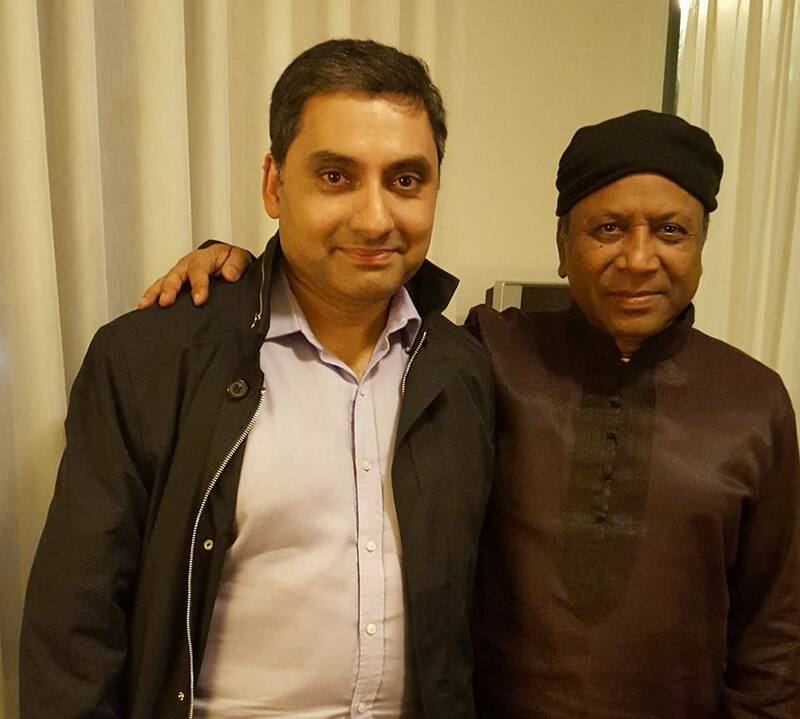 Recently, I had the opportunity to catch up with Ustad Shahid Parvez Khan on his recent Australian visit. Here is a picture of us together. We had a good exchange of thoughts and ideas and tips for practice.. I woke up on New Year’s Day 2015 with a burning desire to play Raga Des (Desh), a beautiful raga from the Khamaj group of ragas which I’ve written about before…. Of particular interest to me were compositions in fast 12 beat time cycle (Ektaal), and by fast, I mean reasonably fast, much faster than what can be usually played on the sarod (especially in the older styles, who emphasize the plectrum hand more than the hand playing the notes). However, this approach has great risks – the real possibility of going offkey at any time due to the speed. So, the only way to get the perfect note is to relax. But if you are rushing at this speed, it’s hard to relax !! As a great fan of both the vocal style and that of my teacher -sitar maestro Ustad Shahid Parvez, I concocted two compositions from each of these idioms. Firstly, the USPK (USPK is shorthand for Ustad Shahid Parvez Khan) composition – what I like about this is the symmetry of the composition. As with everything he plays, there is a method and a plan. I’ve changed everything except the first line, but have tried to keep the same theme going. Ideally, I would have played this at a slower speed, because it allows better use of subtle embellishments, which get squeezed out at higher speeds. Part philosophical treatise, part how-to guide, it’s a deep dive into how a performance is created-an intersection of art and science, intense honesty and brutal self examination. He delivers an elegant and sophisticated analysis of his journey from Disneyland to sold out shows and hit movies with not a single gripe against anyone, solely focusing on improving his art using audience reaction as his guide. Whether you play classical music or hard rock or dance Bollywood and are serious about your art form, this book delivers invaluable insights. 4. Complaining about how the world is sabotaging you is probably not a good strategy – no -one owes you a living. 5. Intense and brutal self examination is important, as is the advice of mentors and seniors. Recently I played at the Independence day function for a local association, and ended up playing Raga Desh. Which made me think of other ragas which are related to Desh. In this category lies the beautiful raga Jhinjhoti. For some reason, Bengalis often call this raga Jhijhit…. not quite sure why…. Jhinjhoti is a sweet raga, full of emotion and feeling. I visualise bright flowers in a beautiful garden when I think of Jhinjhoti. While it’s considered a light raga, there is no end to plumbing its depths…. In the instrumental tradition, the Shahjahanpur Gharana takes the honours for detailed treatment of Jhinjhoti. In particular, two compositions by Abdullah Khan and Mohammed Amir Khan demand special attention. They are rhythmic, bright, sweet and unique. Under the masters of Shahjahanpur, these have become part of the repertoire of a generation. I’ll continue this discussion with the first of these compositions in Drut Teentaal. I’ve been practicing Malkauns a bit lately – in preparation for an upcoming concert. Technically, it’s classified as a member of Bhairavi, however, it is an ancient raga, and the classification system is of recent origin in Hindustani music. In Carnatic music, there is a raga with the same notes, called Hindolam. However, the treatment of the two varies greatly – each according to its own tradition. The simple construction allows beginners to easily pick up this raga – however, like many “fundamental” ragas, it can take a lifetime to explore. That is the magic of North Indian Classical music – you can keep yourself busy with just five notes for decades and never get bored….. In my mind, Malkauns is a slow, deliberate raga – and should not be rushed. Instrumentalists in concert are always under pressure to “do something” or risk putting their concert audiences to sleep. In my mind, there is a fine balance between exploring the raga and repetitive playing. It comes down to the capacity of the musician. My personal preference is not to do lengthy alaps but do a longish vilambit if greater elaboration is required. That keeps the audience’s interest in a raga as well. The sarod lends itself very well to Malkauns technically. The five notes span the Sa and the Ma string. At faster speeds, the open Ma helps. Here is a standard Malkauns Vilambit Teentaal composition recorded on my iPhone in my music room – I’ve tried to maintain the deliberation around the lower Ni and Dha. This composition is certainly not my creation, but bears some resemblance to legendary Amir Khan Sahib’s “Jinki Man Raam”. (Sidenote: Ustad Amir Khan really elaborated the raga and not his “value add”. In doing so, he attained legendary status and added far more value than those who deliberately set out to do so. He would plumb the depths of the raga as a complete devotee – giving us a glimpse of the “inner core” -and he did it so effortlessly, when lesser musicians look for “new angles” to the raga. When a musician starts planning to “value add” to ragas, their ego takes over – and the result is usually not good. (The same goes for those who venture into creating new ragas). 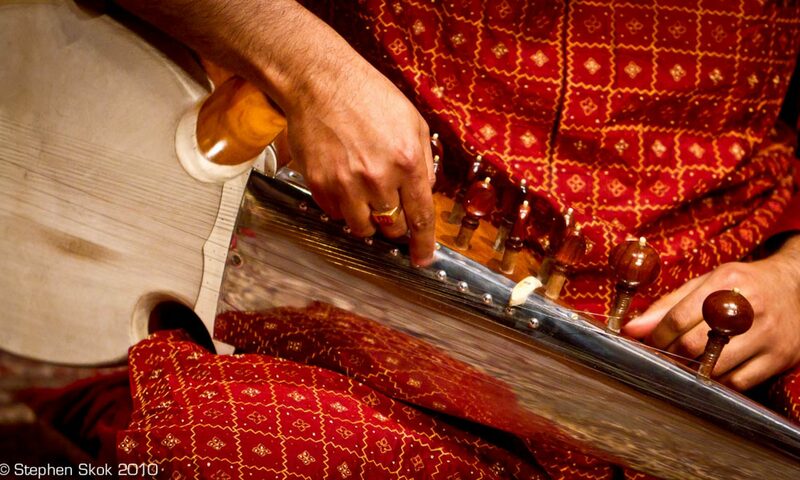 These ragas are greater than any musician – let’s enjoy their essence and be enriched by it. Raga Dhani is a rather uncommon afternoon raga and is not very common on the sarod, although it’s structure lends itself very well to the instrument. Some experts believe it can be played any time of the day and night. I tend to favour the afternoon time cycle. Dhani is an amalgam of Malkauns and Bhimpalasi – if not careful, the identity of the raga is masked by either of these major ragas – so it’s a very delicate balance. There are two schools of thought on Dhani- the common one sees it as a Bhimpalasi flavoured raga, the other sees it as a Malkauns anchored scale. The Re in the descent is sparingly used. I think of Dhani as a “pukar” raga (plaintive calls)- this is where the Malkauns comes in. In particular, the ascent to the M has to be deliberate in my opinion. Since I did not get much material on Dhani, I had to “roll my own”. Most of the established material was too similar to Bhimpalasi – whereas I lean towards Malkauns. As always, all omissions and errors are mine, and this is a one take recording on Mr Zoom H2 in my music room. Ud Amir Khan was one of the greatest musicians of the last century. Although very well known to regulars of Indian classical music, he remains relatively unknown among the population generally. He inspired many stalwarts including Ud Vilayat Khan, Pt Nikhil Banerjee and others. I personally consider his Darbari as the mother of all renditions of North Indian Classical Music of this raga – maybe only Tansen could have surpassed him. Here is a collection of some articles on this “musician of musicians”. Recently, sarangi maestro Sultan Khan passed away – a great loss to the musical community. I met Khan sahab on his 2009 tour of Melbourne, where he performed in the Arts Centre with his brother on the tabla. I will post a clip of that recording – it has a few interesting parts – when he started off, he said “My English is like your Chinese or Japanese – pretty bad”. Then he demonstrated the complex trio of Puriya, Shree and Puriya Dhanashree. In the last raga, he sang the well known khayal ” Payaliya Jhankar Mori” – stopping to explain to the audience the difficult “saas -nanad” (mother -in-law and sis-in-law- who usually give the wife a hard time) relationship. His performance was also marked by an outburst at the organisers on stage. (about a glass of water). 1. The points of emphasis are very deliberate. He really “beds” down the note e.g the Ga Ma movement. This is not that typical of Malkauns treatment. It’s more a reflection of the sarangi (vocal) treatment. This is precisely the kind of innovative raga treatment that I crave. He also played “benchmark” compositions, instead of settling for lesser ones.